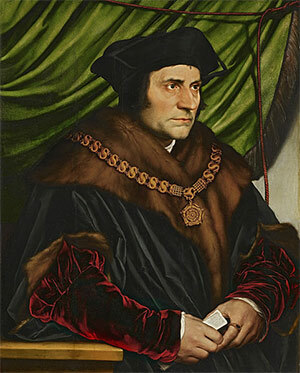 The fame of Sir Thomas More, who became Henry VIII's Lord Chancellor in 1529, rests in great part upon his authorship of Utopia. This novel, written in Latin and published in Louvain in 1516, is generally regarded as the quintessence of Christian humanism in its English context, a brilliant manifesto of social idealism within the tradition of the reforming ideas of Erasmus. More’s vision of human progress was modelled on Plato’s Republic and conceived in terms of imagining a perfect society as the best means of achieving at least its partial realisation in an imperfect, materialist world. Subtitled ‘The Best State of a Commonwealth’, Utopia held out the promise of a basic subsistence to the working-classes, a six-hour working day, national health, state education, universal adult suffrage, religious toleration, and the ordination of women.